We all love a bit of competition do we not? In business the chance to shine amongst your peers is irresistable, and the desire to scale the dizzy heights of victory outweighs the risk of failure and its accompanying slide down the slippy slopes of defeat. Naturally the watch industry lends itself rather easily to competitions based on accuracy. European Observatories have tested timekeeping capabilities since the 18th Century, once commonplace such tests have gradually been in decline since the arrival of quartz movements and their accuracy supremacy. The International Chronometry Competition is one such contest which has been revived and is open to watches which have been made and adjusted in Europe. Unusually it tests the cased-up movement with energy-draining complications running, replicating authentic on the wrist conditions. This is no soft industry showcase event, but rather a horological bootcamp during which the testers perform some rather calamitous activities under strict conditions to beautiful, exquisite timepieces. It's so tough that last time round 72% of entries failed. For 2013 the rules have been changed in favour of the entrants, brands can participate in private if they so wish, but even if they have an outstanding result will be unable to publicise it. Only the names of those who appear in the top three of the open competition will be released to the public. Those who excel privately will kick themselves for not entering publicly, those who do well publicly will have their day in the sunshine, a dilution of the original competition perhaps, but at least it keeps the thing alive. So - as I've stated, cased-up watches made and adjusted in Europe can enter, also there will be two categories - one for tourbillons, one for fixed escapements (fair's fair) and also a student category, which tests a proprietary movement which has been assembled and adjusted by each individual apprentice - an appropriate inclusion but one which at the last competition would have done little to motivate or reward the next generation of watchmakers - because "the jury were not able to rank the entries presented by the watchmaking schools" - in other words none of them made it through to completion and none could be judged - told you it was tough. So - how come this exquisitely crafted piece not only made it through the extreme testing procedures, but also achieved the highest score in the last competition? Allow me to explain. On the home page of the Greubel Forsey website there are three tabs labelled Inventors, Inventing and Inventions. The "Inventors" are of course Robert Greubel and Stephen Forsey, the "Inventions" are the results of their constant and slightly obsessive development of the tourbillon, but Inventing? - a quick click on this tab reveals an insight into the company's EWT or Experimental Watch Technology, their own form of experimentation and testing complete with its own unique research and development facilities. Everything that they create, they test until perfection is achieved and proven, hence their indomitable self-belief in their innovations. In 2009 Greubel Forsey entered a randomly selected piece, one of their Quadruple Tourbillon watches. No special attention had been given to the watch so they were hardly nonplussed when it did not win, it was in fact a rather ingenious "practice run" which would give them a valuable insight into the testing program. By the time entries were being accepted for the 2011 competition, Greubel Forsey had analysed not only the 2009 test results, but also archives of historical test data. Based on this meticulous research they concluded that if properly adjusted, a multi-axis tourbillon could and should win its class - and they had one in mind. For 2011 they chose their Double Tourbillon 30° Technique, having concluded that its inclined position would remain stubbornly unaffected by positional changes - and because the timing tests are recorded over a period of 24 hours, their piece with its generous power reserve would off-load its power with regularity thus accuracy would be maintained. This time preparation was extreme with cycles of adjustment/testing/adjustment carried out in a designated area where their own Experimental Watch Technology could be used. Was the industry suprised that the Greubel Forsey piece not only won the tourbillon category, but was also the highest scoring watch of the 2011 competition? After all, their annual production is diminutive compared to the larger companies. Perhaps some were a little perturbed, however those who have worked with Robert Greubel and Stephen Forsey, those who are familiar with their extraordinary approach to research and development will have predicted their success. Sometimes the adage "Forewarned is Forearmed" is true - even in the genial business of making watches. The results of the 2013 edition will be announced on 24 October at the Musée du Temps in Besançon. 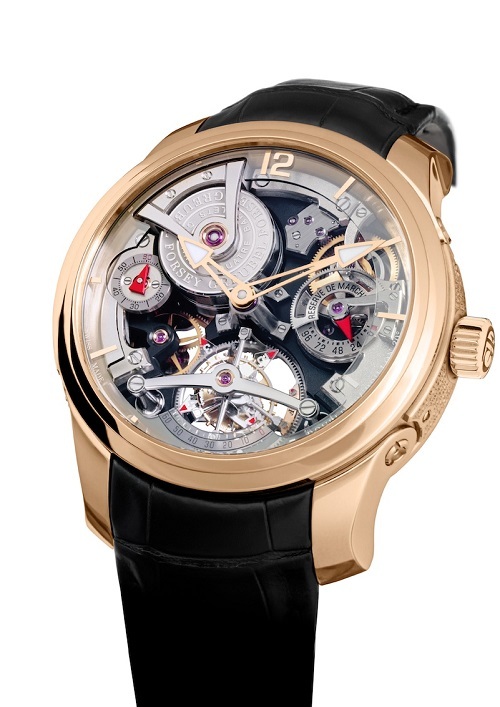 More Greubel Forsey at their official website. More Greubel Forsey in our archives.